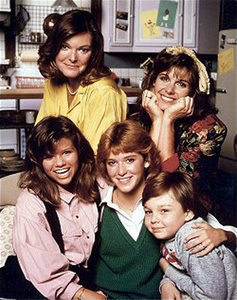 In the 1980s, a sitcom focused on the reality of the changing families came to the small screen with the series Kate & Allie. Created by Sherry Coben, the TV series focused on two women who are recently divorced and decide to live together with their kids in a New York brownstone. Kate, played by Susan Saint James, is a free-spirited and spontaneous, the opposite of her childhood friend Allie, played by Jane Curtain, who is more conservative and likes to plan. Kate has a daughter Emma, while Allie has two kids, Chip and Jennie, all living together in one house. Unlike many other series of the time, the women were shown to be independent and strong, trying to date in New York City and wise to the games many men play. Kate works as a travel agent and constantly battles sexism in her work world, while Allie works at home, and worked on overcoming the stigma of being a housewife. Originally commissioned as a mid-season replacement for CBS Television’s schedule in March 1984, the positive response to the six episodes confirmed a full season renewal. Critics were supportive of the episodes and so were the Emmys, nominating Susan Saint James three times for her role, while awarding Jane Curtain twice with Best Actress in a Comedy Series. During the sixth season, Allie got married and she and Kate were no longer living together but they now shared work duties in their catering company, but this resulted in many viewers and critics saying the show had jumped the shark, and was not renewed for a seventh season. But in its heyday, Kate & Allie offered a modern view of women and the changing face of families in the 1980s. This entry was posted in Pop culture and tagged 1980s, 1984, CBS TV, comedy, humour, Jane Curtain, Kate & Allie, New York City, Pop culture, sitcom, Susan Saint James, tv, tv series, women. Bookmark the permalink.